Over the years, I've asked many gamers about their favorite game soundtracks, and more often than not they respond by listing titles from the 80's or 90's. The Legend of Zelda, The Secret of Monkey Island 2, Chrono Trigger, Castlevania: Symphony of the Night; or maybe Mega Man 2, Final Fantasy VI, Sonic The Hedgehog, or Earthbound. It's easy to attribute those favorites to nostalgia. Their iconic themes make us think of our childhoods, and that's why we love them so much. But when I envision the aural milieu of each of those games, I realize that they have something in common besides the era in which they were released: each game features little to no voice-acting. I don't believe that's a coincidence. Melody is a strong, singular musical presence, and by its very nature it has a lot in common with the human voice. Think about all the great melodies you've gotten stuck in your head over the years— The "Song of Storms" from Ocarina of Time, or the battle theme from Final Fantasy VI; or the opening credits from Game of Thrones, or the chorus of Rick Astley's "Never Gonna Give You Up." Good melodies are easy to sing to ourselves because they engage the same part of the brain that we use for vocalization. And because of that, melody and voice-acting can very quickly come into conflict. Take the work of John Williams, one of the most confident and iconic melodists in Hollywood. His most famous themes are instantly recognizable—Star Wars, Raiders of the Lost Ark, E.T., Jurassic Park—but those themes never play while characters are speaking on-screen. They play during action sequences, or perhaps during the opening or closing credits. When it comes time for characters to talk, those sorts of strong themes fade away, replaced by broader, less intrusive chords—called "pads"—which allow actors' voices to be easily understood. This kind of orchestrational slight-of-hand is necessary any time an actor needs to be audible over a musical score. It's the same trick orchestrators use to allow instrumental and vocal soloists to stand out above a large ensemble. But before the rise of videogame voice-acting, games didn't need to do that at all. Game melodies had the aural spotlight all to themselves. This fact was really driven home for me during my recent (first!) playthrough of Final Fantasy VII. I had roommates at the time, so I played most of the game while wearing headphones. Right off the bat I was struck by the stark, singular presence of Nobuo Uematsu's musical score. It was overwhelming. There was just me, my headphones, and an endless loop of thickly gorgeous music, themes on top of melodies on top of themes. It took me a little while to figure out why the whole thing felt as distinctive as it did, and then I realized that in truth, there was almost nothing coming through my headphones except for the music. Final Fantasy VII has no voice-acting, no ambient sound, and minimal sound effects. Every scene is drawn and punctuated by the music, and the story's wide range of emotions is conjured entirely by enthusiastic, melodramatic melody. If you give yourself over to it, it's spellbinding, like plunging your head into a deep well of sound and symphony. Leigh Alexander and I wrote a fairly epic letter series tracking my playthrough of FFVII, and we even dedicated an entire letter to cataloguing our favorite pieces of music from the game. Suffice to say, there are a lot. Contrast the experience of playing FFVII with the more recent Final Fantasy XIII. In that game, characters are fully voiced, shouting their way through the entire 60-hour game. The mood is constantly interrupted as Snow, Fang, Vanille, and Lightning go off on long-winded monologues about their feelings, their backstories, their favorite ice cream flavors, and every other damn thing. Masashi Hamauzu's musical score is lush enough, but he never really had the space to create anything nearly as dense and affecting as Uematsu's FFVII score. Maybe you're nodding your head right now, thinking, "Hey, this guy is onto something!" Or maybe you're shaking your head, thinking, "What, is this guy on something?" I admit, this kind of thing is hard to put into words, but hopefully the following videos will help illustrate what I'm talking about. I've put together a couple of clips of a famous scene from Final Fantasy VII, one without voice-acting and one with. To really get the effect, you have to watch them both in order. The first scene was recorded with no voice-acting, just as it is in the game. Cloud lies in darkness as voices in his head silently move across the screen. As he awakens, Aeris's flower garden fades into view, easily the most verdant natural scene the game has shown us so far. (Remember, all we've have seen up to this point is the run-down Midgar slums.) Just as we take in the setting, the music begins to play, a soft rendition of Aeris's theme called "Flowers Blooming in the Church." Cloud and Aeris's first conversation is punctuated by moments of silence and odd pauses, but their strange flow only adds to the scene's mystery and charm. 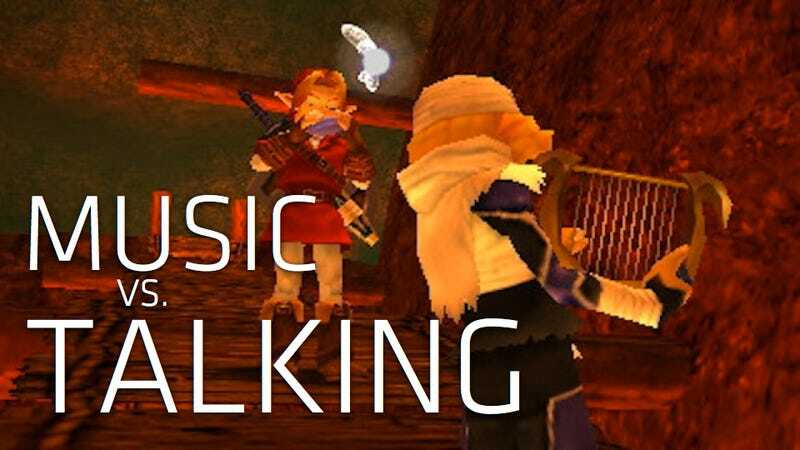 Aeris moves towards the camera, then walks away, and a new instrument picks up the melody as the characters move from introductions to conversation. Through it all, the music reigns supreme. For the second example, I convinced my friend, voice-actor Sarah Elmaleh, to help me re-create the same scene with voiceover performances. (Sacrilege, I know, but bear with me.) As you watch the video, try not to be distracted by the individual performances - notice instead how immediately the presence of a human voice changes the way your ear focuses. Instead of hearing only the gradual swell of the music accompanying the subtle, pantomimed interplay between the two characters, our ears are drawn immediately to the sound of the voices. When Aeris begins to talk at length about her flowers, the soundtrack is swallowed whole. Our ears simply don't have the bandwidth to process both a strong melody and a person talking. Imagine if the entire game had been like that! I think that an HD re-release of FFVII would lose a great deal of the spirit of the original, not because of updated graphics or character models, but because adding a vocal track would sacrifice the lovely stillness of the original game. Look at Advent Children. The vocal cast of the 2005 film is top-notch, but the more the characters talk, the more the film starts to feel like an unfocused mess. That chaotic quality is even more evident when held up against the elegance of the game that preceded it. I remember the voice-acting turning point. It was in the early 1990's. The adventure games I was playing started to include a spoken audio track on their CD-ROM versions, giving those of us with a SoundBlaster the option to finally hear our favorite characters speak. The first game I played that had this option was Sam & Max Hit The Road. Bill Farmer and Nick Jameson's performances were perfectly charming, but I remember being turned off nonetheless. I wanted to imagine the characters' voices for myself, I wanted to slowly make my way through each environment, figuring out puzzles while accompanied only by the goofy musical score. I played Gabriel Knight: Sins of the Fathers with no spoken dialogue, and upon revisiting it, I found that even Tim Curry's scenery-chewing performance as Gabriel didn't work for me. Similarly, I've played through the special editions of the first two Monkey Island games and more often than not I've found myself turning off the vocal track in favor of the original presentation. Don't get me wrong; I have nothing against good videogame voice-acting. Despite the easy jabs at his overexposure, I dig Nolan North's work in the Uncharted games and beyond. The Metal Gear series just wouldn't be the same to me without David Hayter's hypnotic, gravely performance as Solid Snake, and I've even written at length about how much I enjoy the work of Mass Effect's Jennifer Hale. All of those games, the Uncharteds, the Metal Gears, the Mass Effects, purposefully approximate Hollywood films, and so their soundtracks follow the template that's been established by Hollywood composers: big, strong melodies that play only during opening credits and occasionally during less busy action scenes, with the music transitioning to quiet harmonic pads during spoken conversations. Those games have solid, sometimes even great soundtracks, but they're hampered by the cinematic format. They can't compete with the rich musical experience offered by a dialogue-free game. Nowhere is it written that games must approximate Hollywood films, and it's no coincidence that the games with the best soundtracks tend to be the furthest from the Hollywood model. There is an entire school of new, exciting composers doing great work on games that—you guessed it!—don't feature any voice-acting at all. Danny Baranowsky's groovy jams from Super Meat Boy, Souleye's triumphant bounce in VVVVVV, Laura Shigihara's joyfully creepy Plants vs. Zombies score, Double Fine composer Peter McConnell's terrific work on Stacking and Costume Quest, and Jim Guthrie's extraordinary Superbrothers: Sword and Sworcery EP soundtrack. In each of those games, the music doesn't simply compliment the story or characters, it's a character unto itself, and a vital part of the overall experience. It could be argued that if spoken dialogue isn't an integral part of a videogame, neither is music. After all, it's perfectly possible to play most games with the sound turned all the way off. But sound effects, spoken dialogue, and music should't be lumped together so easily. As I argued in my column last month, I believe there is a fundamentally musical aspect to the act of playing a game, and the presence of a good soundtrack heightens and compliments those mechanical rhythms. Like a well-written duet, the interaction between gameplay and musical score creates a fascinating sort of über-composition that is unique to the videogame medium. As developers add spoken dialogue and sound effects to their games, they should always weigh the value of those things against the possibility that they will overshadow their game's other vital aspects: bounce, flow, rhythm, and feel. Games and music can both wordlessly convey feelings of challenge and stress, joy and terror, and progression and release, and a talented composer can weave his or her melodies straight into a game's mechanical systems to create something dynamic and uniquely beautiful. But that's only possible if he or she is given the space to do so - there's a fine line between music and sound, and an even finer one between sound and cluttered noise. Kirk Hamilton is a writer and musician in San Francisco. He is the games editor at Paste Magazine and writes about music, games and culture for a variety of publications. His monthly column at Kotaku focuses on the many ways that music and video games intersect. He can be found at kirkhamilton.com and on Twitter @kirkhamilton. Email him at Kirk [at] KirkHamilton [dot] com.